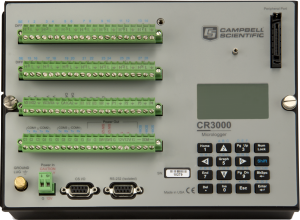 LOGAN, Utah – Campbell Scientific’s CR3000 Micrologger® builds on the company’s reputation for rugged, reliable, and low power measurement and control instrumentation. It retains the versatility of its predecessor, the CR23X Micrologger®, yet provides increased memory, faster processing, and more measurement channels. The CR3000 uses state-of-the-art digital technology while retaining the fine analog measurement capability associated with Campbell Scientific instrumentation. A CR3000 Micrologger is designed to provide editing capabilities with an internal CPU that is accessible via the on-board keyboard and LCD. When deployed in an environmental enclosure, the CR3000 will withstand extreme climate and weather conditions to collect research-grade environmental data. The CR3000 provides the flexibility to measure most commercial sensors, uses minimal power, and offers many options for data telemetry. Applications include eddy-covariance systems (micrometeorology), mesonets, air and water quality, and structural monitoring.